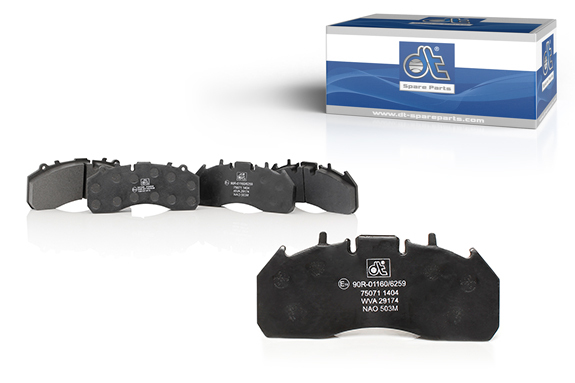 Disc brake pads must represent an optimum friction partner for the brake discs, and meet the highest demands, even in dusty or wet environments. Disc brake pads have to withstand temperatures of up to +800 °C with blazing hot brake discs and always be ready to function. They are among the most highly stressed parts which are subject to wear. Only high-quality materials made of metals, fibers, fillers, lubricants and organic ingredients are used in production. The properties of disc brake pads of the brand DT® Spare Parts are perfectly coordinated with the characteristics of the brake discs of the same brand. This results in the best possible friction combination. Disc brake pads of the brand DT® Spare Parts have been tested by the “TÜV Nord” for performance and degree of wear, and have completed an elaborate test procedure with good results. They also comply with the guidelines of the ECE-R90 Standard. Disc brake pads should always be replaced axle-wise at the same time. When replacing brake discs, the disc brake pads must also be replaced. After fitting new brake components, a certain running-in period is required before the full braking effect is achieved. In addition to disc brake pads, the complete range of the brand DT® Spare Parts also contains all standard accessory kits and brake discs.